100 Women Who Care is based on the simple concept of bringing together 100 local women to make a large impact within their community. 100 Women. $100 Each. $10,000 Local Impact. 100 Women Who Care is based on the simple concept of bringing together local women to make a large impact within their community. We meet four times per year, bring a $100 cheque to be donated to one of the three charities presenting that night. Therefore, 100 women x $100 = $10,000. But it doesn’t stop there! We don’t stop at 100 women; in fact, the more the merrier! We are looking to make the biggest local and immediate charitable impact we can. 100% of the proceeds go towards the winning charity that night. 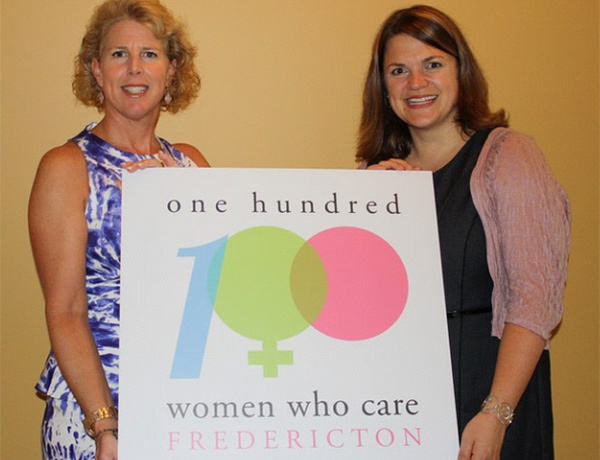 100 Women Who Care Fredericton is for you! Donna Gardiner-Thompson is a full time realtor with the family owned business, Gardiner Realty/Gardiner Properties. She is a wife and a mother of two grown children, and has been living in Fredericton for over 38 years. Actively involved with local charities, and eager to begin a new avenue for women in the area to give back to their community, she jumped at the chance to be a co-founder of 100 Women Who Care in the Fredericton chapter. Anna Migchels is the Founder & CEO of Massage2Go. As a wife and a mother of three young children, she is eager to make a local impact in the biggest way possible. When Anna heard about the organization 100 Women Who Care, she immediately knew that it would resonate with the women of Fredericton as much as it did with her. With Donna by her side, and Fredericton’s incredible support, she has no doubt that 100+ women are ready to take the city by storm and create a huge local impact.